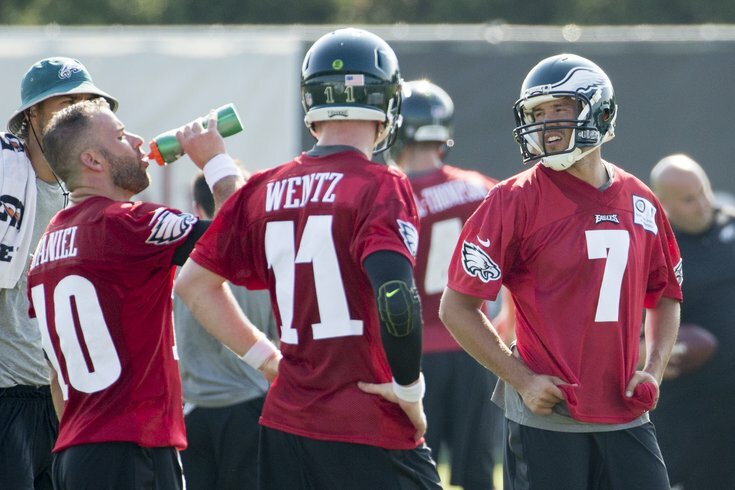 Chase Daniel shows Sam Bradford and Carson Wentz how Doug Pederson wants his quarterbacks to drink water. ...and the first day was boring. The Eagles do not yet have their full team here, as the first few days of camp are restricted to rookies, quarterbacks, and select veterans. "It's a great three days to get acclimated, number one, to the schedule," said Doug Pederson. "It's great for the coaches to get back into the swing of football and thinking football before we get the rest of the team in here. And then I think, thirdly, just getting the quarterbacks in here and getting their arms loose and kind of getting into a full lather before they really get cranked up Friday, Saturday, and the rest of camp." • One of the Eagles' undrafted free agent acquisitions this offseason was RB/WR Byron Marshall out of Oregon. Marshall is an interesting player, and seemingly a good fit for the Eagles' offense. In 2014 at Oregon, Marshall had 74 catches for 1003 yards and 6 TDs for the Ducks as a WR. He also carried the ball 52 times for 392 yards and 1 TD. In 2013, he was primarily a running back, when he rushed for 1038 yards and 14 TDs on 168 carries (6.2 YPC). He missed most of the 2015 season with an ankle injury. Pederson values running backs who can be weapons out of the backfield as receivers. Today Marshall made a lot of catches and looked comfortable snatching the ball with his hands. On one play, I had a little bit of an obstructed view, but it looked like he made a nice one-handed stab. Marshall would certainly fit the bill as a back with receiving skills. I also liked what I saw out of Marshall as a pass protector, Travis Long was coming off the edge and Marshall aggressively ran up and struck him. Admittedly, I did not watch tape of Marshall to see what kind of pass protector he was in college, but at a minimum, he seems willing. Marshall did not participate in spring camps because Oregon is on the quarters system, but he is off to a nice start. The Eagles' first preseason game is only four days away, and Sam Bradford has yet to make anything close to an athletic move with his legs through OTAs, minicamp, and the beginning of training camp. That would be 17 practices in total that have been open to the media. While he has come a long way in terms of mobility since he first took the field at the end of May, he still looks like he has a ways to go. The closest he came to an athletic play with his feet was during one of the practices at Lincoln Financial Field where a lane opened up in the middle of the field, and he ran it past the line of scrimmage for a few yards. He then stopped and dropped the ball for the next play. Otherwise, I cannot recall another time he has attempted to tuck it and run, again, in 17 practices. To note, quarterbacks run the ball with regularity in training camp. Typically, if nobody is open, they can either throw it away, or try to extend the play by escaping the pocket, rolling out, and eventually turning it upfield. Mark Sanchez has done it quite a bit. Matt Barkley has done it, and even had a TD run today. Nick Foles did it regularly when he was here. And Lord knows Tim Tebow does it like 30 times per practice (estimated). It's just a normal thing that happens during practice. But save for that one run jog up the middle at the Linc, there's been none of it from Bradford. Today, in his first practice of training camp, Bradford took a snap from under center, tripped over one of his offensive linemen's feet, regained his balance, turned his body, and fired a completion to the sideline. Having observed him for a full training camp in 2015, I do not think that is a play he would have made a year ago. I believe he'll get off to a better start to the season than he did a year ago, although, obviously, that is not at all a high bar. • Bradford also made a nice back shoulder throw down the seam to TE M.J. McFarland, who initially made the catch, but UDFA LB Myke Tavarres stuck with the play and was able to rip the ball out. • Speaking of TE, McFarland is the only one here, so newly acquired QB McLeod Bethel-Thompson was getting reps at TE. Bethel-Thompson is like a #NextGJKinne. They even wear the same number (4). • A pair of corners had nice pass breakups today. Aaron Grymes made an athletic play on a deep ball down the sideline, and Jalen Mills broke up a fade pattern. Mills' nickname here, by the way, is the "Green Goblin." He sounded a lot like Jim Carrey in Dumb and Dumber when he said, "Hey guys, Big Gulps, huh? Alright... Well, see you later!"